-Replace refined white sugar or artificial sweeteners (Splenda, this means you!) with natural sweeteners like agave nectar, raw honey, grade-b maple syrup, 100% fruit juice, fruit pulp, stevia, or sucanat. -Replace white flour with whole wheat flour (whole wheat pastry flour for more tender baked goods), or other milled whole grains. This not only benefits you nutrition-wise, but there are so many flavors to discover! Try nut flours, buckwheat, brown rice flour, spelt..etc..etc. The list goes on and on. Many of these are available in local organic markets, but if you can’t find them locally try Amazon or www.bobsredmill.com. -Replace soda and sugar-laden juices with 100% fruit juices and (more importantly) water. Not a fan of plain water? Try sparkling water with a dash of fruit juice for a fizzy drink fix. I’ve come to a point in my journey where I’d like to try not to focus on numbers so much and instead listen more to my body. Do I feel full? If I feel hungry, is it head hunger or real hunger in my stomach? I’m still logging my food because I need to keep tabs on protein/vitamins. Also, reaching that kind of intuitive state is going to be difficult for me, and frankly I have a lot on my plate right now with school and work. It’s a goal I’ll reach someday, but I think it will be a slow transition. Who knows, though? Maybe meditating on it and learning to center myself will benefit me all around. 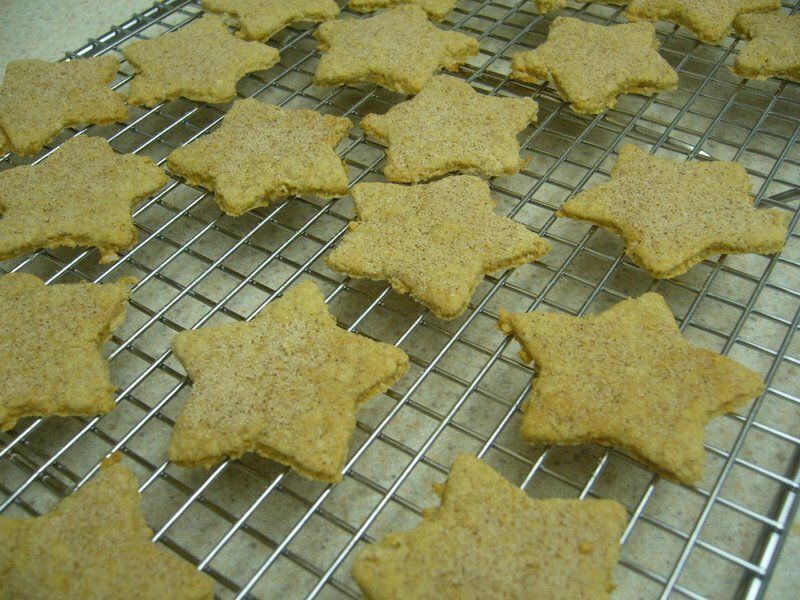 Now, you can’t possibly think that I would dare show you a picture of delicious star cookies without sharing the recipe! (I’d never be so cruel.) Those tasty morsels are my new treat. I’d advise freezing them in bags of 4-5 cookies each for easier portion control. 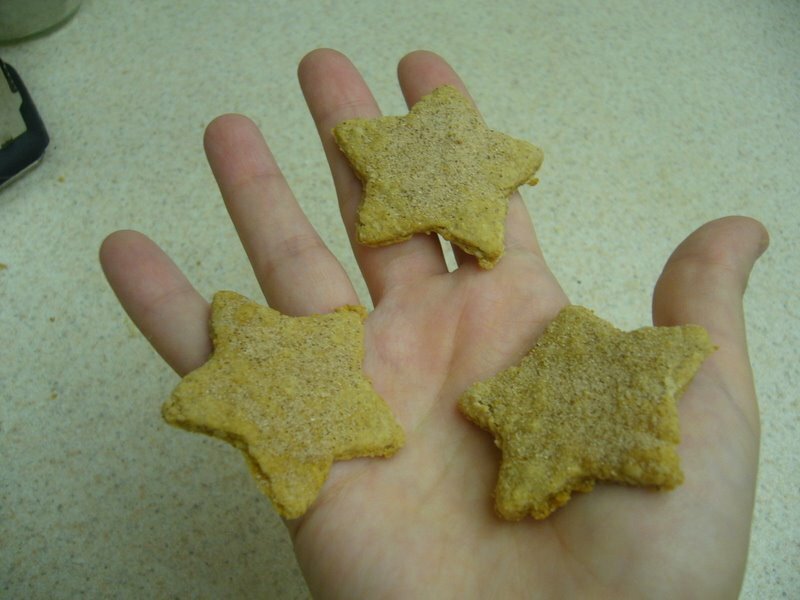 I call them Whole Wheat Pie Crust Stars because they taste more like a lightly sweetened buttery pie crust than a sugar cookie. All I know is that they go great with cup of hot chocolate almond milk. Mix the fructose and teaspoon of cinnamon in a small bowl and set aside. Combine the flour, oats, salt, baking soda, and cinnamon in a bowl and mix thoroughly. Using a pastry cutter or the tines of 2 forks, cut in the butter until the mixture reaches the consistency of coarse cornmeal. Some pea-sized pieces are fine. Add the agave nectar, extracts, and buttermilk and mix until a stiff dough forms. If it’s too sticky, add a small amount of flour. Roll the dough into a ball and chill in the freezer for 10-15 minutes. Roll the dough out to 1/8 inch thick on a lightly-floured board and cut into desired shapes with cookie or biscuit cutters. Lay the cookies on a baking sheet lined with parchment paper and sprinkle the fructose/cinnamon mixture over them. NOTE: Fructose is nearly twice as sweet as sugar, so use it very lightly. A tablespoon was enough for 40 star cookies. Bake the cookies for 9-10 minutes or until the edges are just golden. Move immediately to a cooling rack. Serve warm or at room temperature. Variation: Instead of cinnamon/fructose, try heating some all-fruit preserves until somewhat liquefied and drizzling them over the baked cookies. This works really well with spiced-apple preserves. It becomes an apple pie cookie! The yield depends on the size of your cookie cutters. My small star cutter made about 40 cookies at 28 calories a piece. Not bad for a little treat! I bet crumbling 3-4 of them and adding them during the last 2-3 minutes of churning some protein ice cream would make a killer cookie ice cream. Well that’s all from me today. I’ve got a lot of schoolwork, but I’m really glad I had some time to share my thoughts here. I really enjoy writing and hearing from all of you who try the recipes. Thanks for continuing to inspire me. Ciao for now, friends!